Prenatal care refers to all of the care that a pregnant teen or woman receives from a health care provider while she is pregnant to keep both her and her baby as healthy as possible and to recognize any problems at the earliest possible stage. Prenatal care is ongoing and works best when the regularly scheduled appointments are kept. In fact, research has shown that babies of women who have received prenatal care are less likely to have a low birth weight or even die, than if the mother did not receive prenatal care. 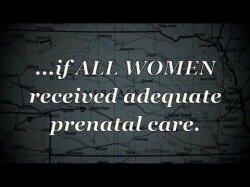 Prenatal care may be provided by different health care workers. These include an obstetrician, who is a medical doctor; a midwife; or a nurse practitioner with a specialty in obstetrics. A typical prenatal care plan will involve a monthly appointment during the first six months of pregnancy, biweekly appointments in the seventh and eighth months, and weekly appointments in the ninth month. The health care provider may recommend particular vitamins, with particular attention to folic acid. If a woman is planning to become pregnant, beginning to take folic acid three months prior to becoming pregnant is currently recommended. Also, when a planned pregnancy is being considered, making sure that the mother has received all necessary immunizations, particularly those like rubella and chicken pox that are known to harm unborn babies. signs of labor, such as lightening, effacement and dilation of the cervix, nausea, breaking of the waters, etc. Particularly for first time mothers, some discussion of care of a newborn may also be discussed.